Woodford Reserve Bourbon Whiskey is a popular Whisky available from Tesco Groceries in 70cl to buy online. Visit Tesco Groceries for the best price for 70cl of Woodford Reserve Bourbon Whiskey or compare prices on our other Whisky products. KENTUCKY STRAIGHT BOURBON WHISKEY. THE BARRELS THAT ARE USED FOR THIS EXCEPTIONAL HAND-CRAFTED BOURBON HAVE BEEN SPECIALLY SELECTED BY OUR MASTER DISTILLER. We honor our Kentucky heritage with a truly unique small batch bourbon of unparalleled quality - Woodford Reserve. THE ART of making premium whiskey on the site where The Woodford Reserve Distillery now stands dates back to 1812, when Elijah Pepper moved his distilling operation from behind the Woodford County Courthouse in Versailles to the banks of Glenn's Creek. This Kentucky landmark, nestled amidst the horse farms of the Bluegrass, is not only the oldest distilling site still in operation in the state, but also the only place in Kentucky where you can see our two most famous products made side-by-side: bourbon whiskey and thoroughbreds. A setting as unique as this, can only be home to whiskey of equal quality and heritage. Such a whiskey is Woodford Reserve. Several years ago our Master Taster carefully selected the barreled whiskey that would go into Woodford Reserve. He nurtured it along until it reached its peak. The reward for his dedication to his craft is Woodford Reserve. The folks along Glenn's Creek are proud of this whiskey. We think you will be too. If you're ever in Woodford County, feel free to drop by our little operation and we'll show you how fine Bourbon is made. Where to buy Woodford Reserve Bourbon Whiskey ? Woodford Reserve Bourbon Whiskey Supermarkets & Stockists. 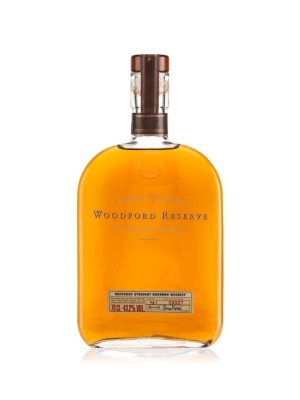 You can buy Woodford Reserve Bourbon Whiskey online in most retailers and find it in the Whisky aisle in supermarkets but we found the best deals online for Woodford Reserve Bourbon Whiskey in Tesco Groceries, Waitrose Cellar, Amazon.co.uk, 31dover.com, DrinkSupermarket.com, TheDrinkShop, and others. Compare the current price of Woodford Reserve Bourbon Whiskey in 70cl size in the table of offers below. Simply click on the button to order Woodford Reserve Bourbon Whiskey online now.